Updated Tuesday October 16, 2018 by Red Circle Hockey Club. Please look at the image. Now consider a few things. How would you feel if that official were your child. 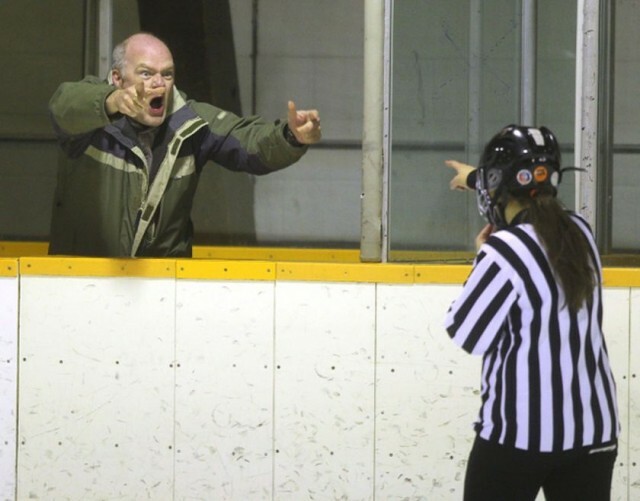 Far too often we make the assumption that all officials are seasoned at this, when in fact they are here learning just like your child on the ice. We all start somewhere. Remember the first few days you were on the job? Would it have been appropriate for your boss to scream and mock you each time you made a mistake? Would you have stayed in that position if you were frightened? We as parents come to watch our child out on the ice, and most times our focus is on them. Clearly if something happens to them we become upset if no call is made. We simply cannot understand how the official missed it. What we fail to understand is that we are watching one child, while the official is busy trying to watch two entire teams. The officials are human, and we all know humans make mistakes. Take another look at that image. It is not only the official who sees your reaction. Each and every child is subjected to the fear and rage. It has a negative impact and is not fair. It is also not tolerated by the City of London or Red Circle. You can be banned from City Arenas for life for this type of behaviour. We need to bring respect back to the game. Hockey is a great sport and it allows us the perfect opportunity to teach our children respect. This begins with you. Respect the Officials, respect the Coaches, respect the Volunteers, respect each other. Let's have an amazing season! !